Outdoor design features and elements like fire pits and fireplaces, functional and decorative lighting, and wireless connectivity top the list of the most requested amenities received by landscape architects working on residential projects. Every year, the American Society of Landscape Architects (ASLA) conducts surveys among its members to learn how design features, elements, and projects rate with their clients. Landscape architects are asked to evaluate the expected popularity of a variety of residential outdoor design elements for the coming year. The survey is conducted in February and March with 808 professionals participating. Find out if your next project or desired element made the list. All of these projects are in demand, according to the most recent survey results from the ASLA (2018). Consulting a landscape designer about patio furniture is a smart idea for an overall cohesive design. They can help determine placement, size and scale, materials, color, style, and help you choose actual pieces. If you are seeking an eclectic look, a designer can pull it together effectively without making it look like a tragic hodgepodge. 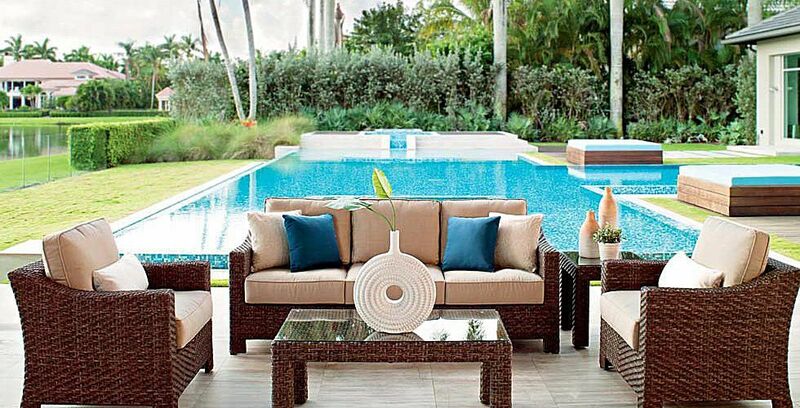 Keep in mind that outdoor furniture tends to be oversized--it's built to relax and lounge on. Arrange all the pieces in your designated space, making sure there is room to move about and it doesn't collide with other elements, like structures and plants. Furniture should also relate to the style of the landscape materials and certainly the home's architectural style. Besides being a source of light, a fire pit provides warmth on cool summer evenings, and gives you a reason to go outside and stay there during the colder months. Models range from portable types that can be moved around within a yard to a permanent pit made of brick, stone, or concrete. Landscape architects and designers can design pits that blend with existing or new hardscaping. It serves as a gathering spot in your yard, especially in the evening. It can be a focal point or visual feature in a yard, serving as an anchor for an outdoor living room or kitchen. It provides a larger source of heat than a fire pit. Some can be monumental in size. Functionality: What is needed for safety and practical purposes. Accent: Lights that are used to highlight focal points in the outdoor space. Most lighting designers use low-voltage systems (12 volts), to save energy and reduce costs. Lighting is often designed in layers, starting with the perimeter to call attention to the property's boundaries, followed by paths. Stairs and accent lighting come next, with an emphasis on safety and highlighting garden features. While it may seem like a fairly simple request—an outdoor dining set or deep-seating set in your backyard—it isn't always as easy as plopping it down on the first bare patch of grass or concrete. A landscape architect or designer can help define each area of a yard, creating spaces for certain activities in subtle ways that tie together everything and facilitates foot traffic. Most often this is achieved by using hardscaping features, like setting a dining area apart with low stone walls, yet allowing quick access to a grill or outdoor kitchen area. Even with small spaces, designers know all kinds of tricks to make areas appear larger, utilize every square foot of a tiny plot, and establish seating areas, rooms, and boundaries. Unless you have a flair for design and planning, consult a professional to help you get the most out of your outdoor space. Cooking style: Are you a weekend chef or do you grill almost every evening? Wood or composite decking adds warmth and a natural beauty to outdoor flooring that concrete does not. It goes with most architectural styles and blends with the environment. A landscape architect can design a deck that is the ideal size, shape, and location for your yard. A grill or charcoal barbecue is one of the most popular amenities of a yard. It may not be higher up on this list because many already own one. If you cook outside just a few times a month or less, a smaller stand-alone model should suffice. If you are more serious about grilling, choose a model that has built-in cabinets and extensions for extra cooking and prep space. If the grill will be part of an outdoor kitchen with counters (see above), buy a built-in grill that can be set on a custom-built substructure or counter. Another consideration: gas or charcoal. Many prefer the convenience of gas or propane, while some can't do without that smoky flavor of a charcoal barbecue. If you dine outside, it's not always practical or effective to use a fire pit or fireplace as your heat source. This is where outdoor heaters come in handy, and are essential if you often dine outside and have several tables set up. It can mean the difference between a pleasurable experience and one that is shortened by a drop in temperatures. Propane or natural gas: Heat is directed down and can warm up to 25 square feet. Natural gas is a reliable heat source. Infrared: Permanent models are wired to a patio roof directly over a seating or activity space. Portable models are plugged into an electrical outlet and placed near patio dining tables or outdoor living rooms. Living outdoors with all the comforts of indoors extends to working on your laptop, streaming a hit Netflix series while lounging on the deck, or relaxing to your favorite tunes. View the yard as rooms or zones, and decide where you might want to add audio in these areas. Possibilities include pool areas, kitchen and dining areas, and outdoor living rooms. Work with a designer or consultant who specializes in outdoor safety, speaker arrangement, and can work within your budget. Some experts recommend running an ethernet cable that is weatherproof and can be buried in your yard or setting up a hot spot in your garden. Unless you have the expertise for making this happen, consult a landscape architect, landscape designer, or electrician. If they can't handle it, they will probably know someone who can. Ask for references before signing the dotted line. Bulky equipment of the past has been replaced by smaller, portable, inexpensive Bluetooth systems. For great sounds, invest in high-quality speakers, from ceiling models that are good for pergolas and covered patios to in-ground and rock-shaped speakers.